Teaching at Hanford covers so much more than the National Curriculum. We are more greenhouse than hothouse looking to bring out the best in each individual girl. We offer an enlightened education which results in outstanding academic performance as evidenced in year on year Scholarships for the past 27 years: academic, art, drama, sport, all-round. We teach French from Year 4 and Latin to the majority of the classes. There are school exams twice a year, and the girls are regularly tested to monitor reading, spelling and reasoning ability. Children are streamed as appropriate. 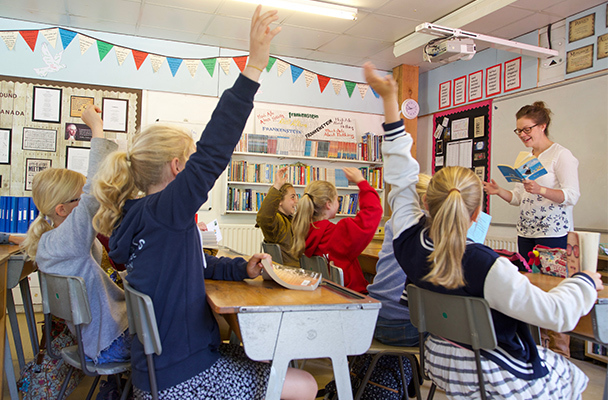 The curriculum is taught by subject specialists, with children moving between classrooms for each lesson. We have an up-to-date ICT room and make sure that our girls leave us with good computer skills – but we know that proper education is about much more than expensive technology. We always try to be as flexible as we can, providing children with the support they need. For some, this means preparation for a scholarship or individual lessons in Russian or Mandarin. For others, it may mean extra help in English or Mathematics. We do whatever we can to bring the best out of every child. Small classes and proven teaching methods mean that girls of all abilities do well at Hanford. In recent years all our children have passed Common Entrance into the schools of their choice. Girls have gone from Hanford to Benenden, Clayesmore, Bryanston, Cheltenham Ladies College, Downe House, Godolphin, Leweston, Marlborough, Roedean, Sherborne Girls, St. Mary’s Ascot, St. Mary’s Calne, St. Mary’s Shaftesbury, Stowe, Tudor Hall and Wycombe Abbey. We are not a hothouse and do not seek to make children conform to any particular pattern, but over the same period, academic, art, and music scholarships have been awarded to Bryanston, Downe House, Marlborough, St Mary’s Calne, St Mary’s Shaftesbury, Sherborne Girls, Talbot Heath and Tudor Hall.